Now everyone can love bruschetta, even the tomato-phobic foodies out there! (And yes, tomato phobia does exist.) 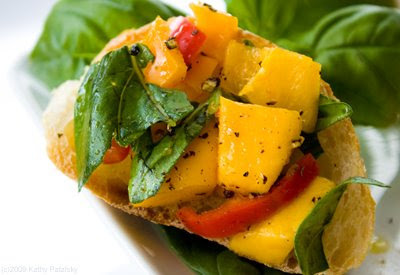 Yellow Mango Pepper Bruschetta is a tomato-free bruschetta that combines the sweet flavor of fresh diced mangoes with the zesty crunch of yellow baby bell peppers. Sweet basil, chopped garlic and wine vinegar bring the tangy-sweet flavors together. Daytime Bruschetta. This light fruit-accented bruschetta is perfect for an afternoon snack or brunch side dish. 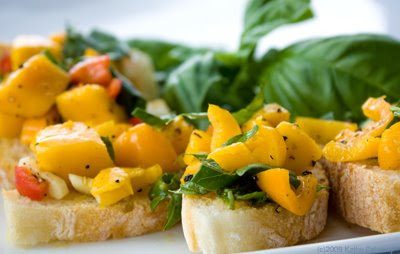 Pair this Mango Pepper Bruschetta with a classic Sunshine Bruschetta and give your guests a delicious bruschetta spread. Healthy bite. Mangoes are high in Vitamin A and C. Peppers are also high in Vitamin C. Plenty of antioxidants in this recipe. Plus heart-healthy garlic. This bright yellow dish deserves the spotlight. Add all ingredients to bowl. Toss well. Slice ciabatta bread into 1/2 inch thick rounds. Toast lightly, or keep raw. Spoon 1 Tbsp of mixture onto each slice of bread. Garnish with fresh basil. For extra sweet slices, drizzle with agave or honey. Grind fresh black pepper on top.